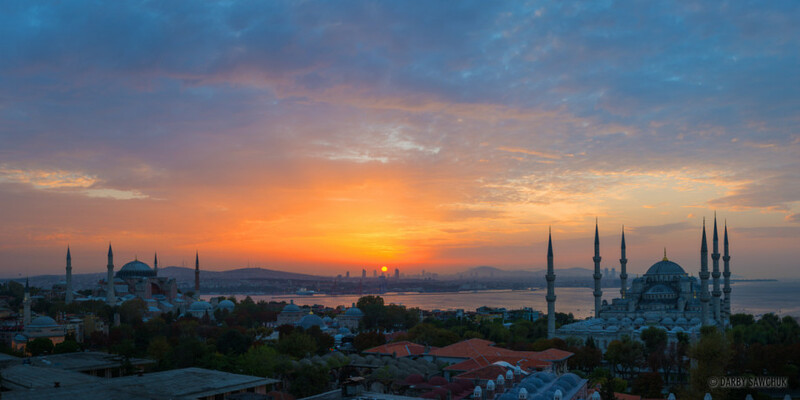 Istanbul is magic. Every stone in this crossroads of culture seems to have shared in a historic moment. It’s a special feeling to know that every corner probably has a story that spans millennia. The past bleeds into the present to colour the memories of its charismatic citizens and the visitors wandering its streets in wonder. A game of backgammon on the shores of the Bosphorus. Sipping tea with a Grand Bazaar vendor. Kid in a candy store giddiness upon sight of mouth-watering baklava. Sunset meze on a rooftop terrace accompanied by muezzins singing from all directions. The waft of air ejected from a spinning dervish. All these moments are up for grabs in this incomparable city. 01. 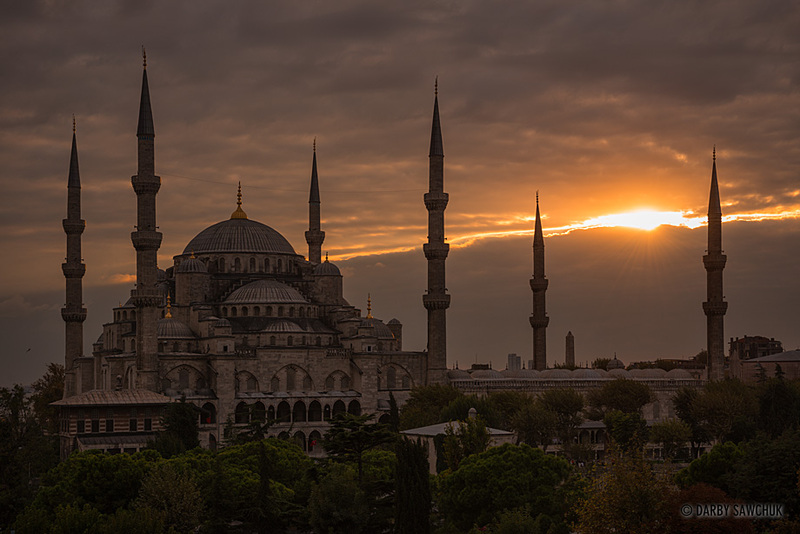 Evening sun bursts through a split in the clouds above the Sultan Ahmed Mosque, also known as the Blue Mosque, in Istanbul Turkey. 03. 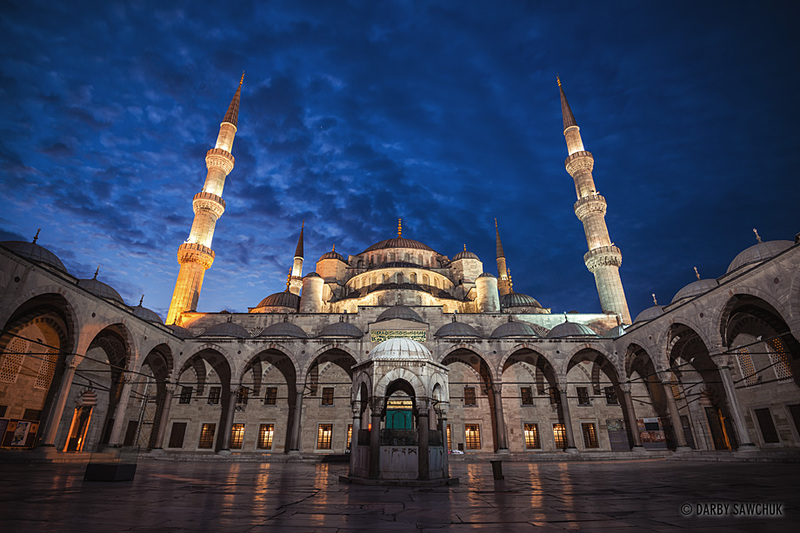 The inner courtyard of the Blue Mosque before sunrise in Istanbul, Turkey. 04. 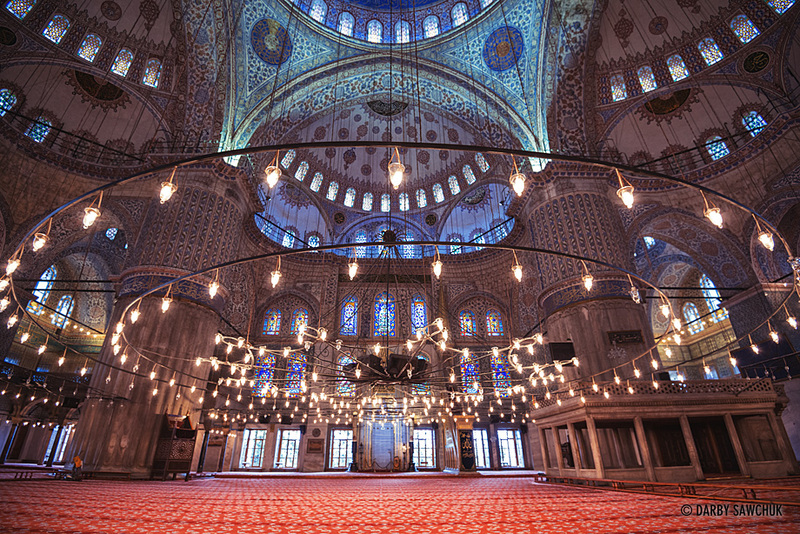 The prayer area inside Istanbul’s Blue Mosque lit by lamps hanging from the ceiling. 05. 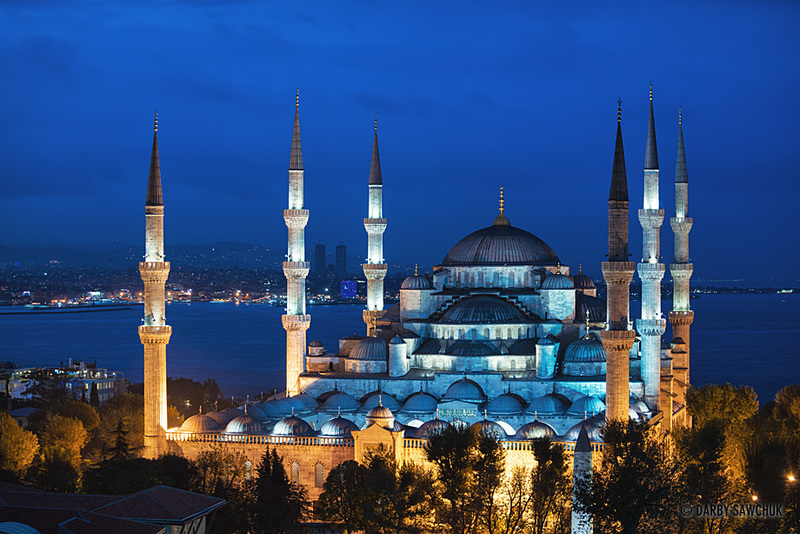 The Blue Mosque in Istanbul Turkey at dusk with the Bosphoros straight behind it. 06. 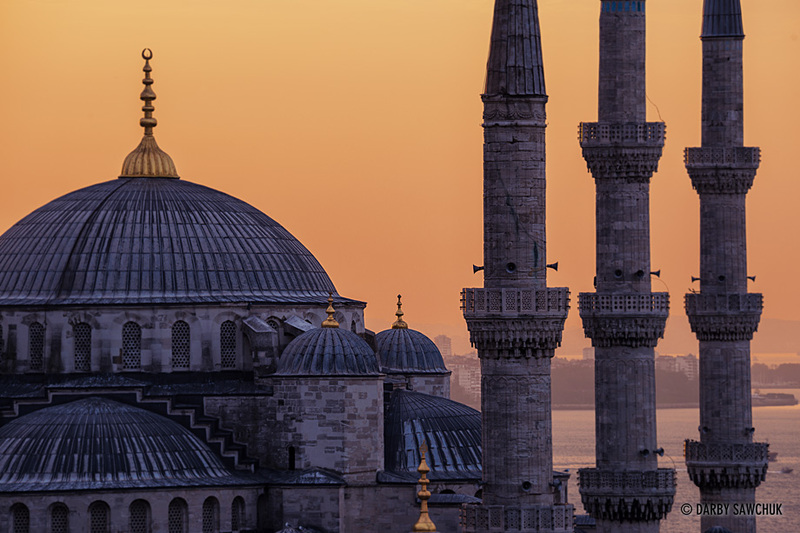 A close up view of the Blue Mosque’s domes and minarets at sunset. 07. 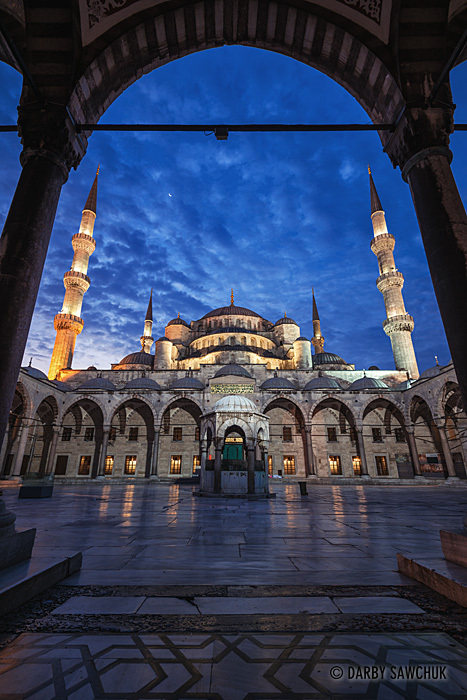 The inner courtyard of the Blue Mosque before sunrise in Istanbul, Turkey. 08. 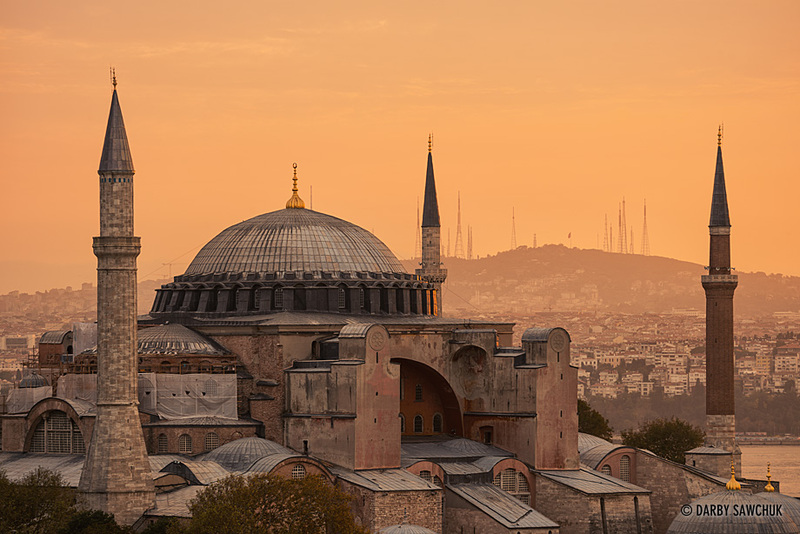 An orange sunrise glow illuminates the Hagia Sophia museum with Camlica Hill in the background. 09. 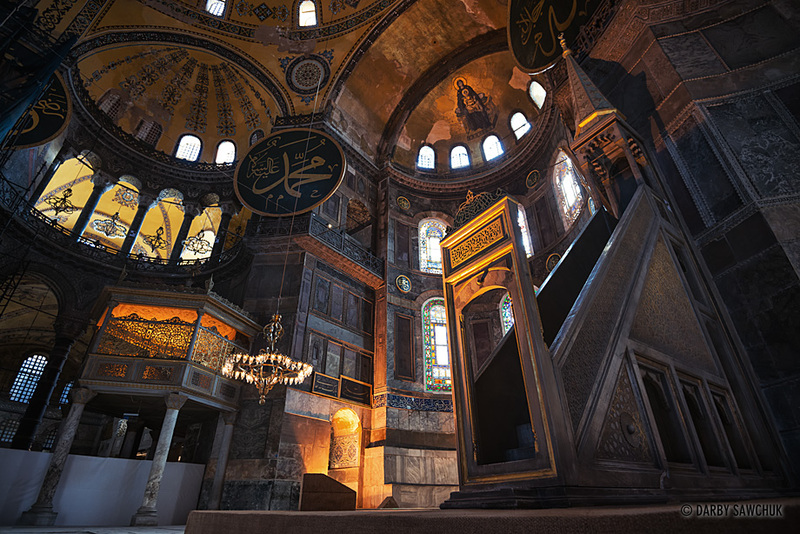 The vast, decorated interior of Istanbul’s Hagia Sophia, formerly a Christian bascilica, a mosque and now a museum. 10. 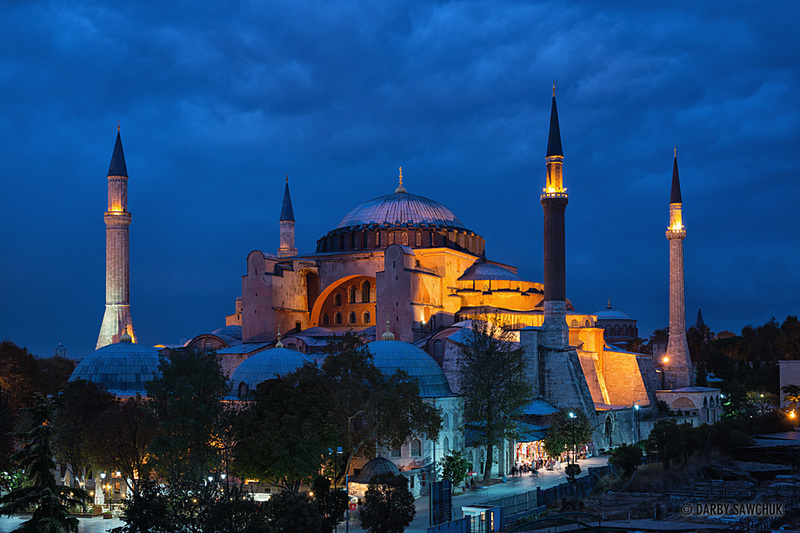 The Hagia Sophia, also know as the Aya Sofia, at dusk in Istanbul, Turkey. 11. 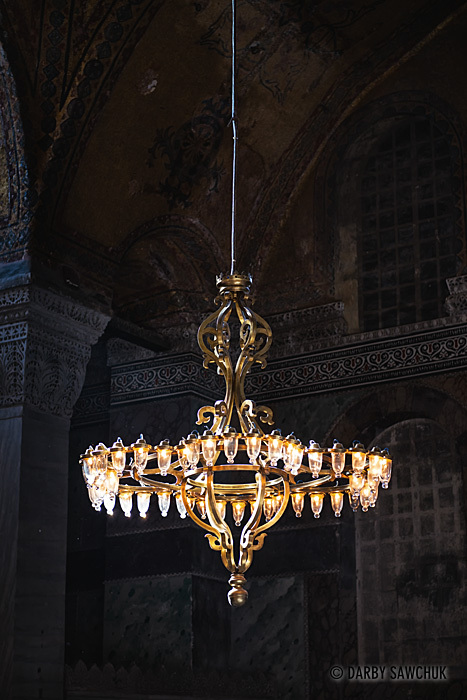 A chandelier of lamps illuminating the interior of the Hagia Sophia museum in Istanbul, Turkey. 12. 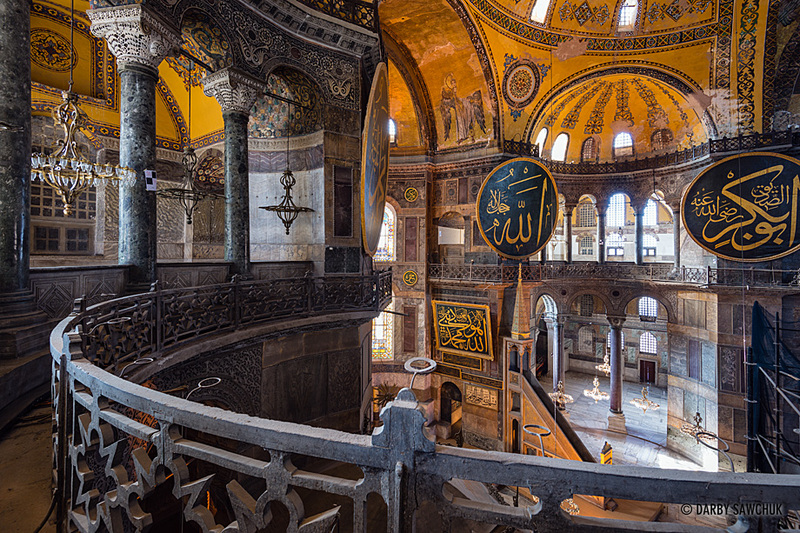 The minbar (pulpit) of the Hagia Sophia with the apse and its golden mosaic of the virgin and child. 13. 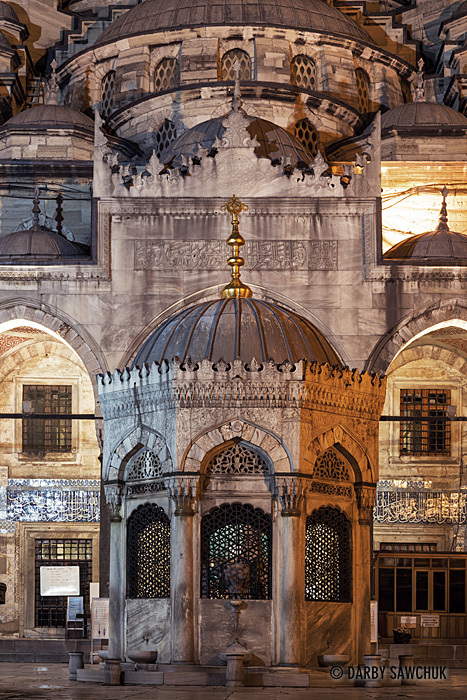 The Tomb of Sultan Mehmed III, one of five tombs belonging to Ottoman Sultans adjacent to the Hagia Sophia Museum. 14. 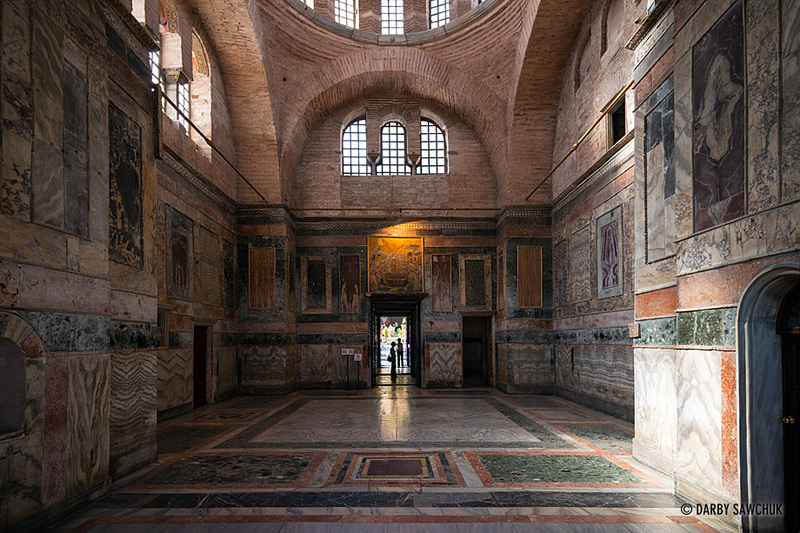 The main room of the Chora Museum, formerly a Byzantine Church, then later a Ottoman Mosque. 15. 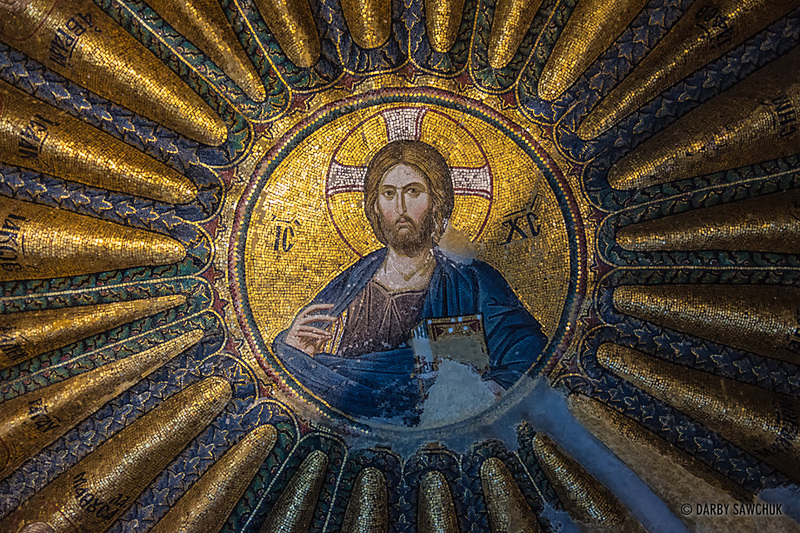 A close up of the Christ Pantocrator mosaic on the dome of the inner narthex in the Chara Church in Istanbul, Turkey. 16. 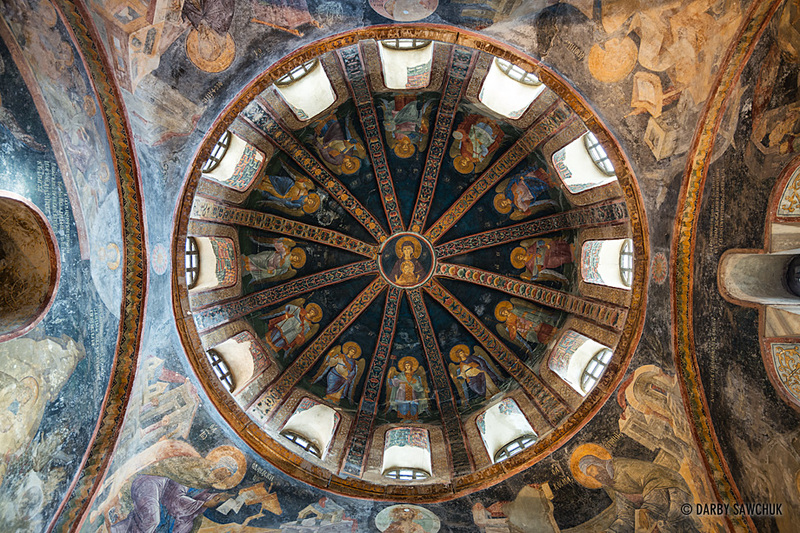 The virgin and child are centred in the painted dome of the parecclesion of Chora Church, in Istanbul. 17. 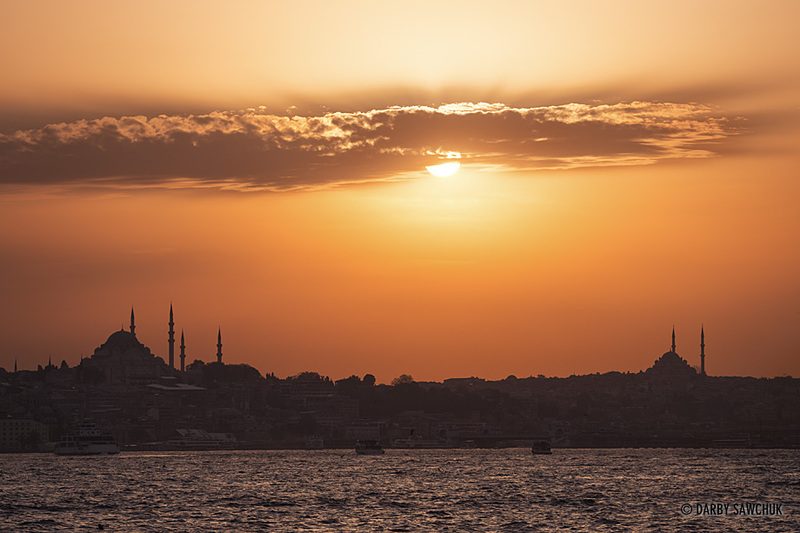 Evening sun silhouettes mosques piercing the Istanbul horizon across the Bosphorus Strait. 18. 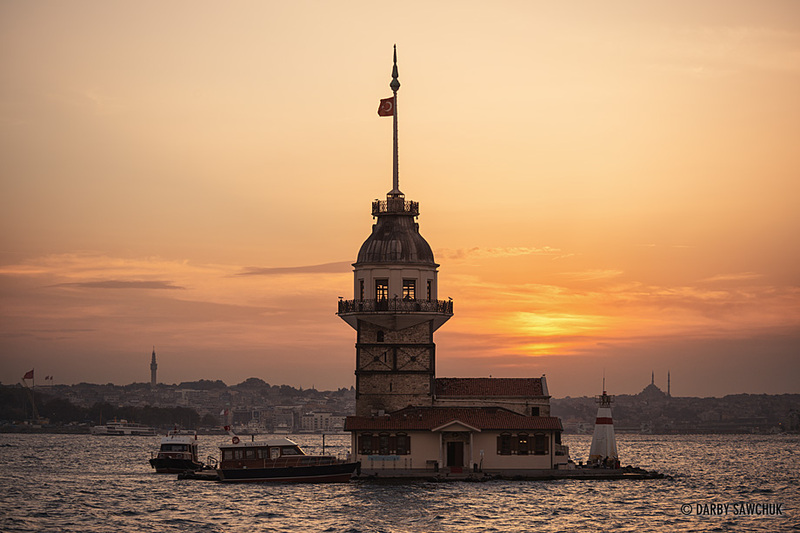 The Maiden’s Tower, (Kiz Kulesi) a tower on an islet in the Bosphorus strait in Istanbul, Turkey at sunset. 19. 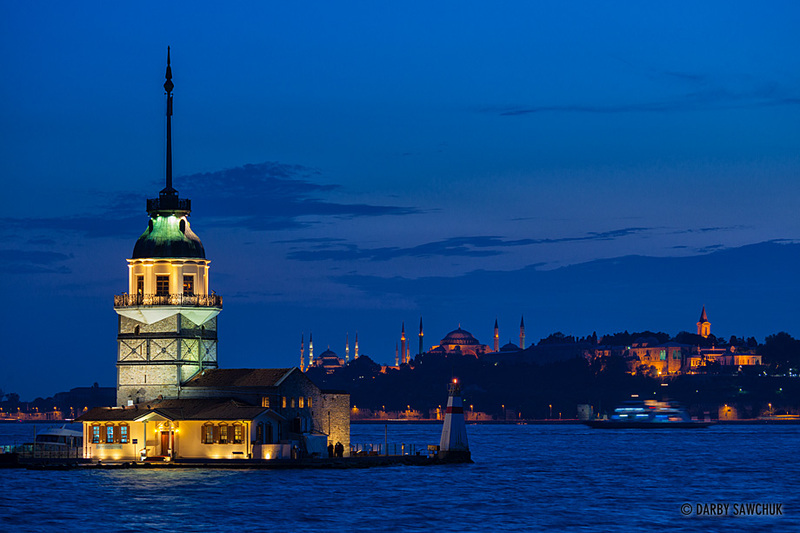 The Maiden’s Tower, (Kiz Kulesi) a tower on an islet in the Bosphorus strait in Istanbul, Turkey at dusk. 20. 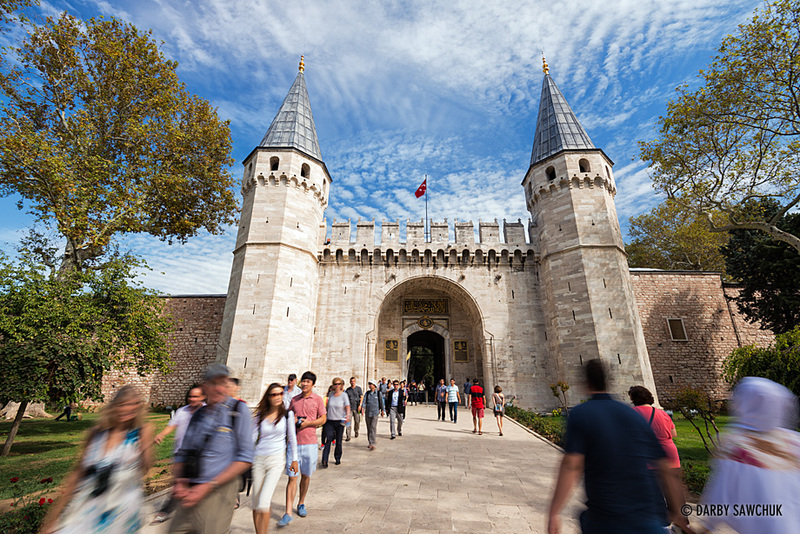 Visitors stream in and out of the Gate of Salutation, the entrance to the second courtyard of Topkapi Palace in Istanbul. 21. 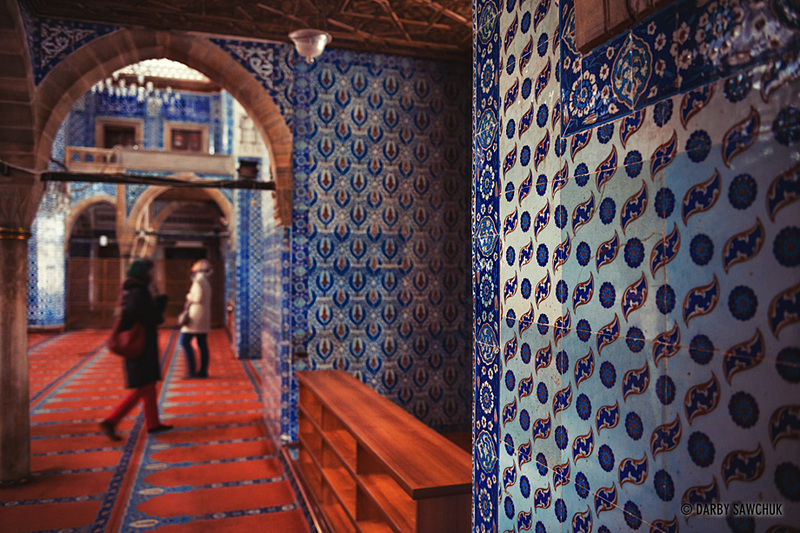 Intricate tiles adorn the interior of Topkapi Palace in Istanbul, Turkey. 22. 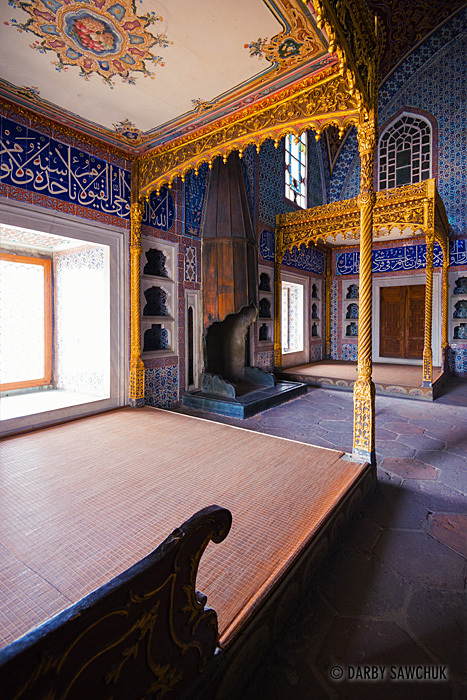 Colourful tiles decorate a bedchamber inside Topkapi Palace in Istanbul, Turkey. 23. 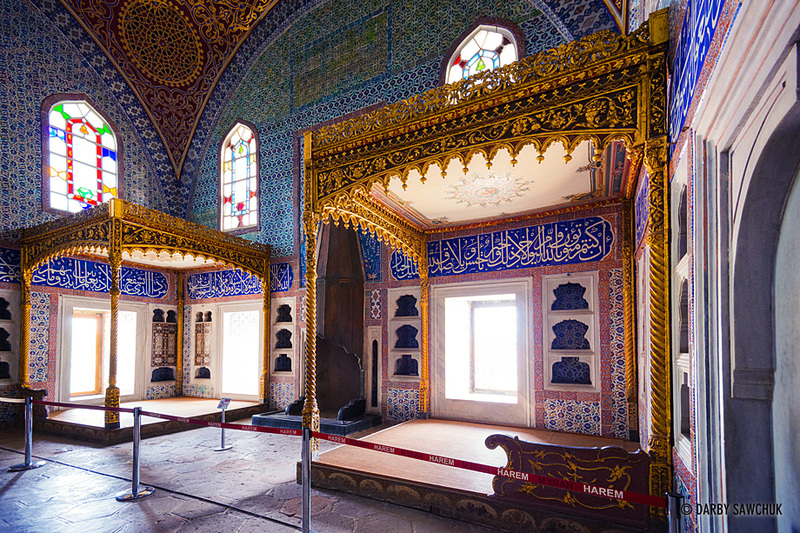 Colourful tiles decorate a bedchamber inside Topkapi Palace in Istanbul, Turkey. 24. 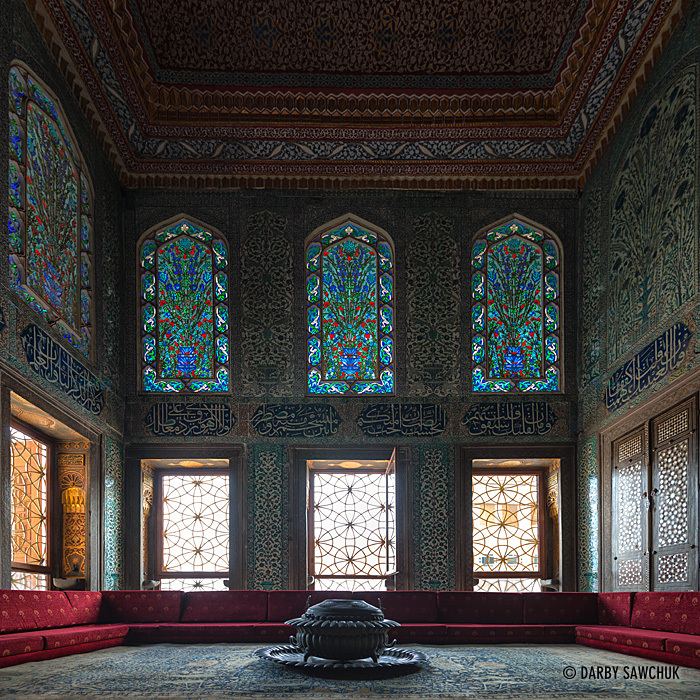 One of the Harem rooms inside Topkapi Palace in Istanbul, Turkey. 25. 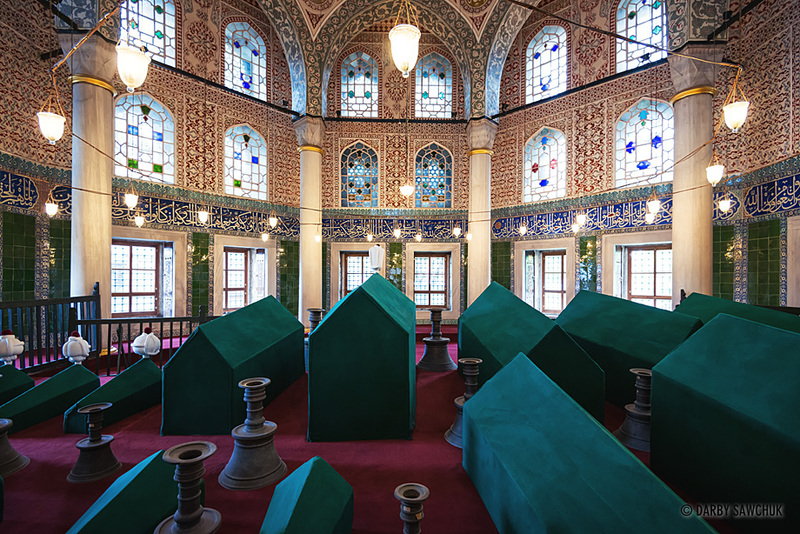 The ablutions fountain within the inner courtyard of the New Mosque in Istanbul, Turkey. 27. 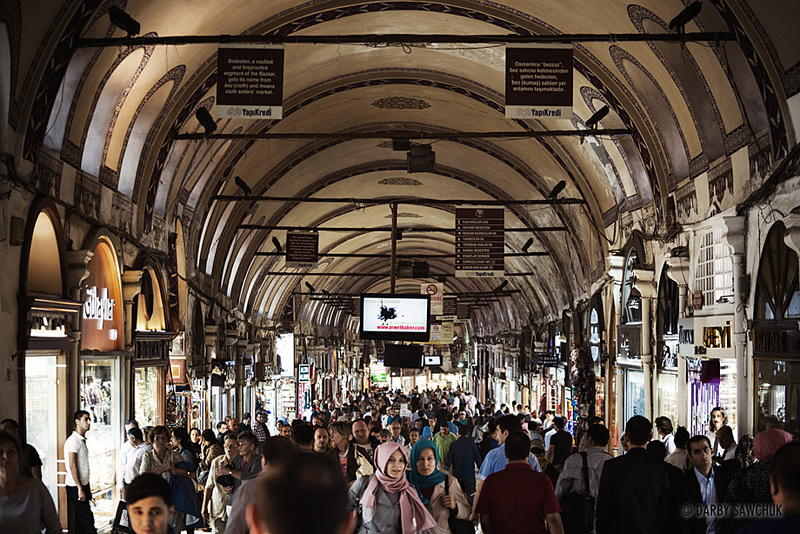 Crowds of shoppers flow through Kalpakcılar Street, known for its jewellers in the Grand Bazaar. 28. 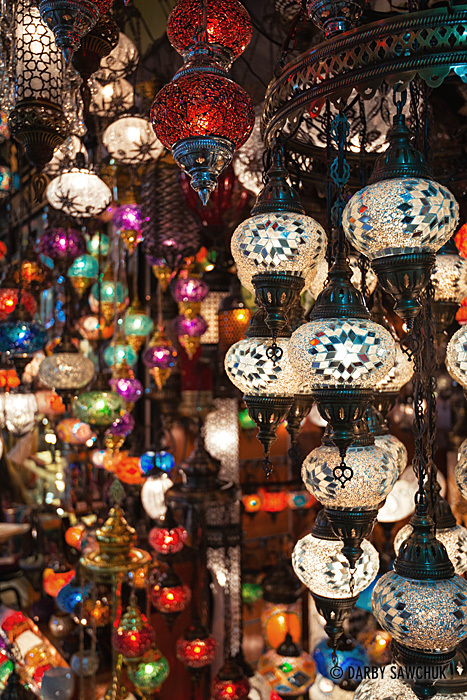 Ornate, colourful, glass lanterns hang outside of shops in the Grand Bazaar in Istanbul. 29. 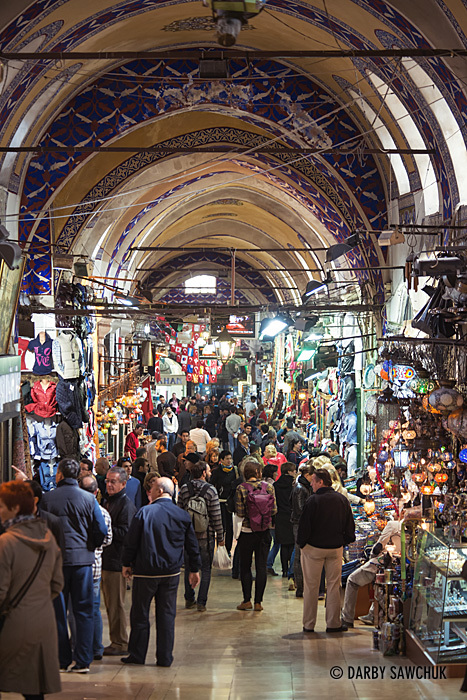 Shoppers browse both traditional and modern wares in the covered markets of the Grand Bazaar in Istanbul. 30. 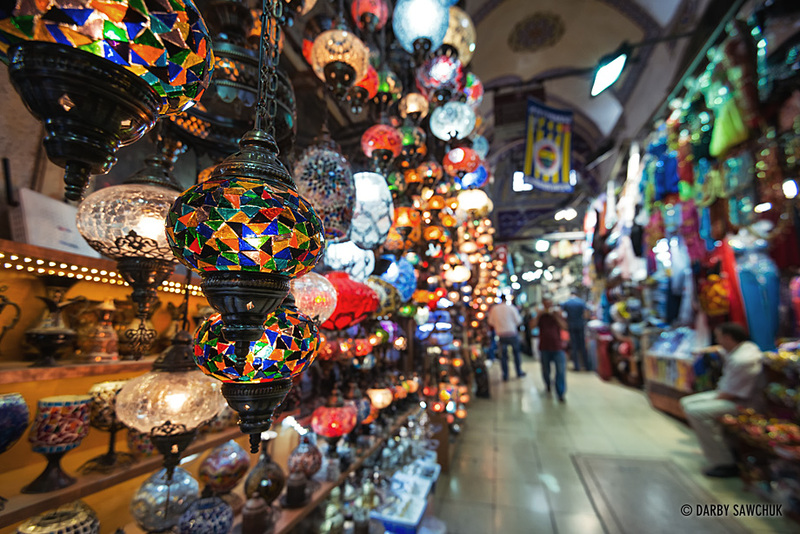 Ornate, colourful, glass lanterns hang outside of shops in the Grand Bazaar in Istanbul. 31. 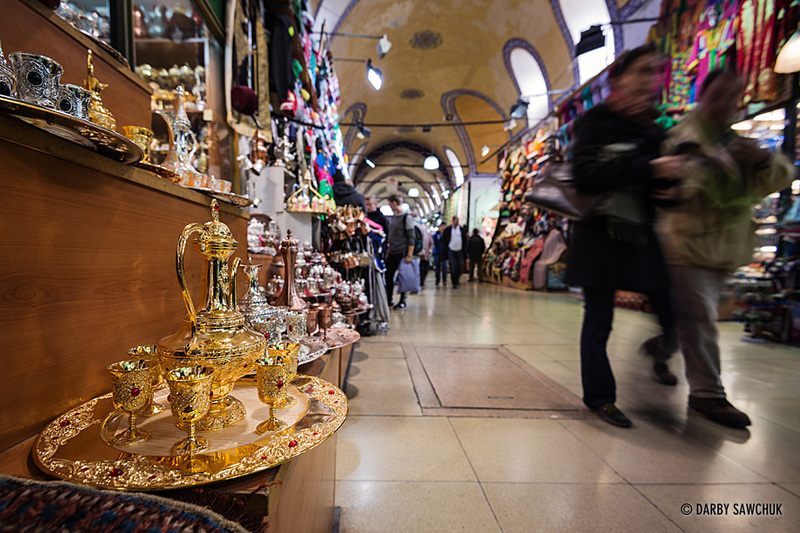 Shoppers browse traditional tea sets in the Grand Bazaar in Istanbul, Turkey. 32. 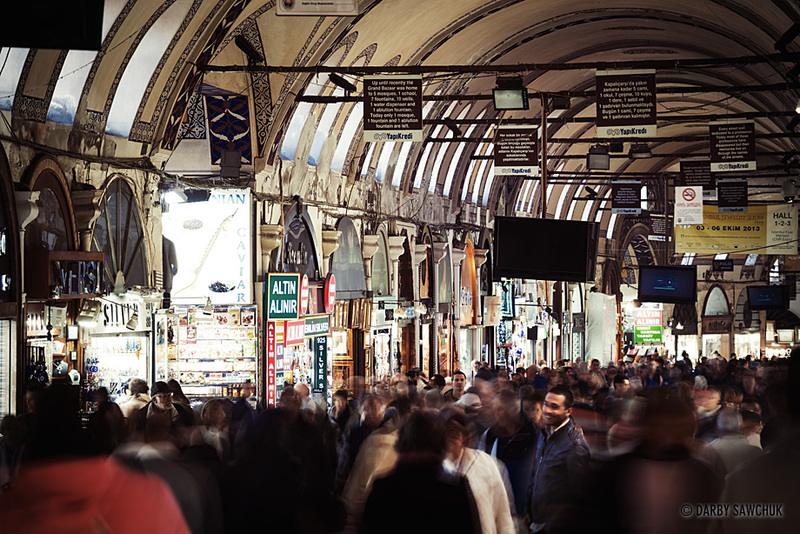 Crowds of shoppers flow through Kalpakcılar Street, known for its jewellers in the Grand Bazaar. 33. 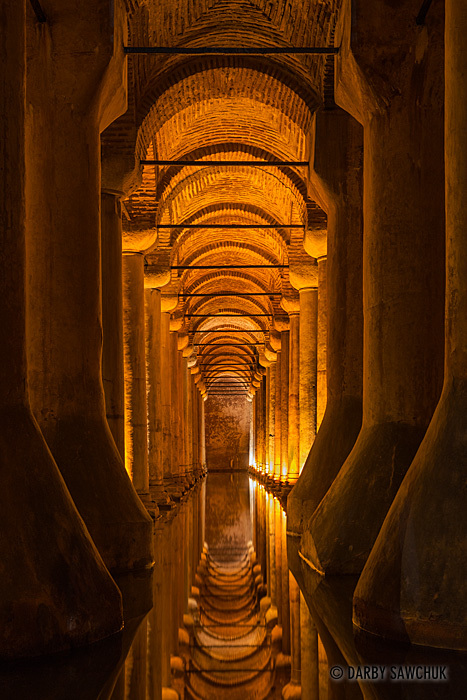 The columns of the Basilica Cistern in Istanbul, Turkey. 34. 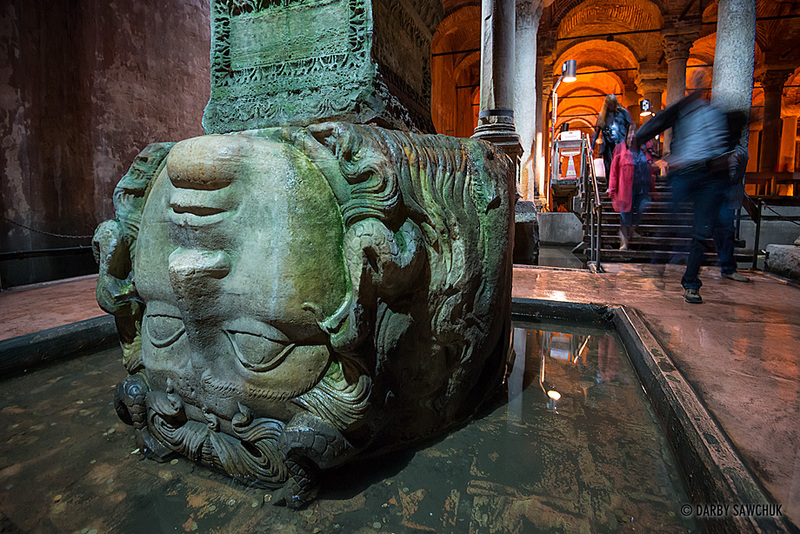 The upside down Medusa head supports one of the many columns inside the Bascilica Cistern beneath Istanbul, Turkey. 35. 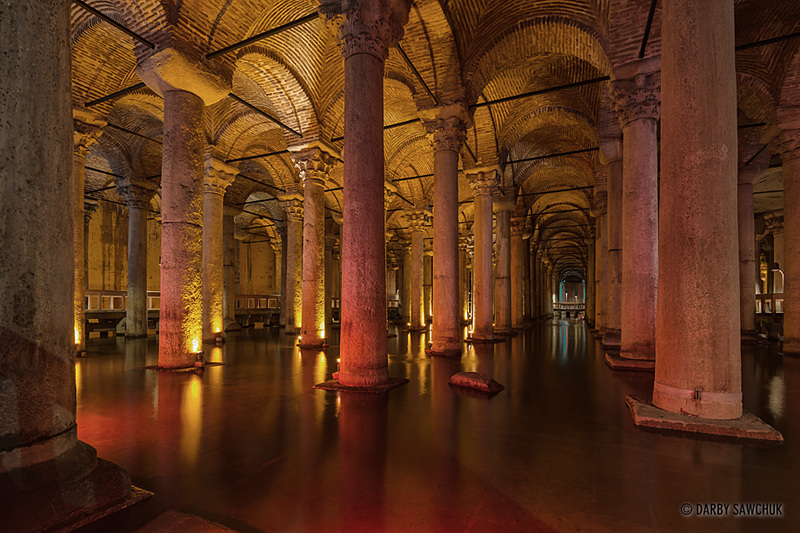 A gallery of columns underground inside the Basilica Cistern in Istanbul, Turkey. 36. 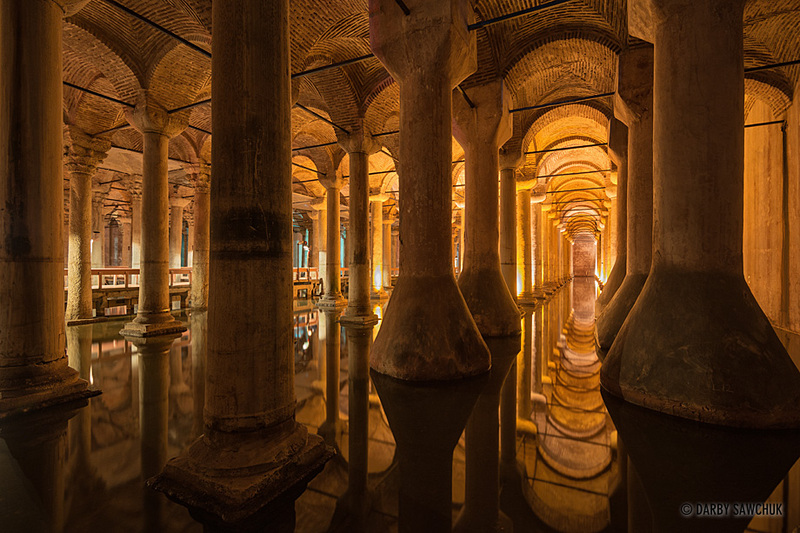 The columns of the Basilica Cistern in Istanbul, Turkey. 37. 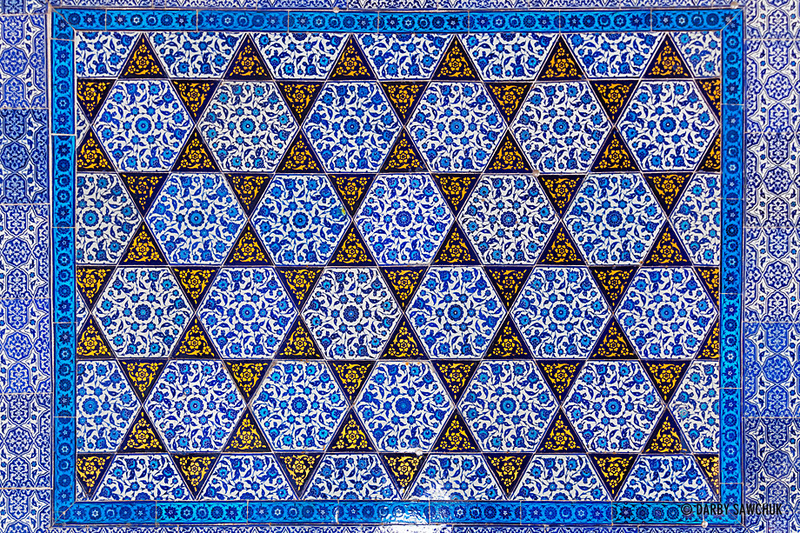 Blue İznik tiles decorate the interior of the Rüstem Pasha Mosque, in the Fatih district of Istanbul, Turkey. 38. 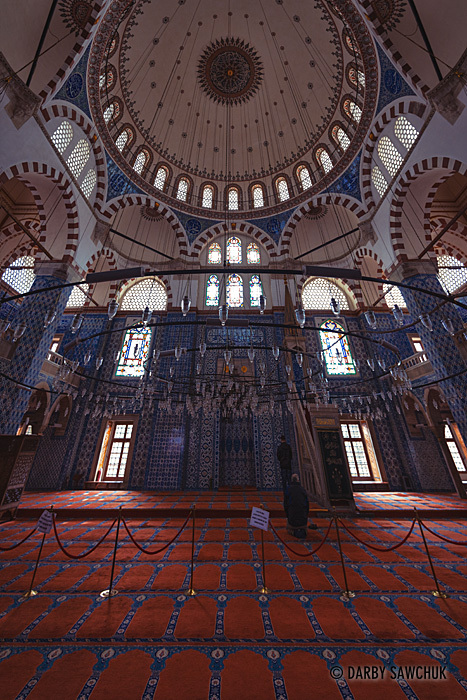 The interior of the interior of the Rüstem Pasha Mosque in Istanbul, Turkey. 39. 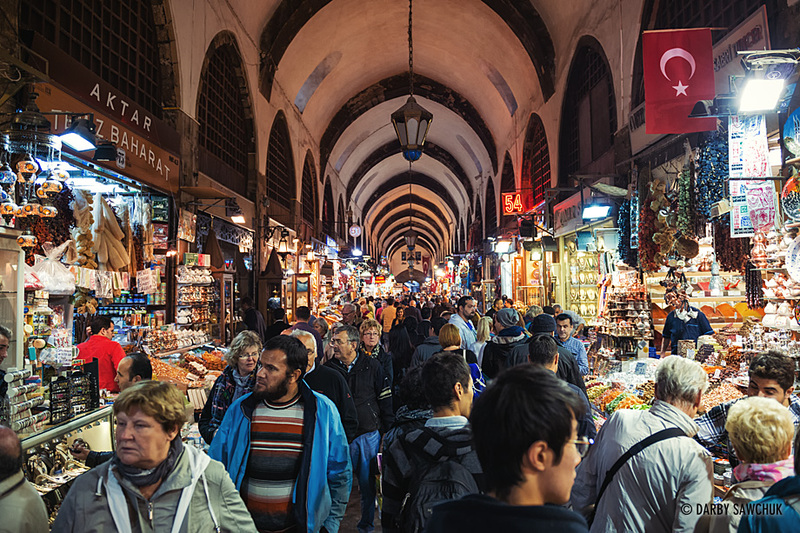 Crowds of shoppers peruse the stalls at the Spice Market in Istanbul, Turkey. 40. 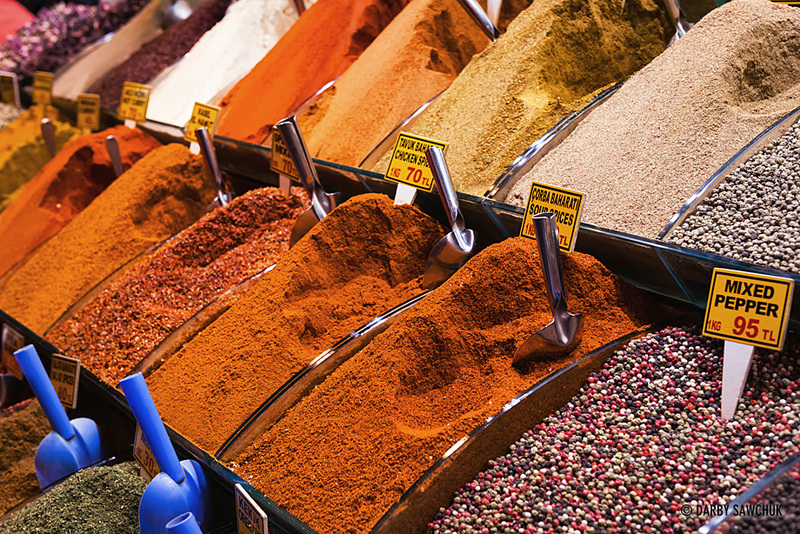 Wide varieties of colourful, fragrant spices on offer at the spice market in Istanbul. 41. 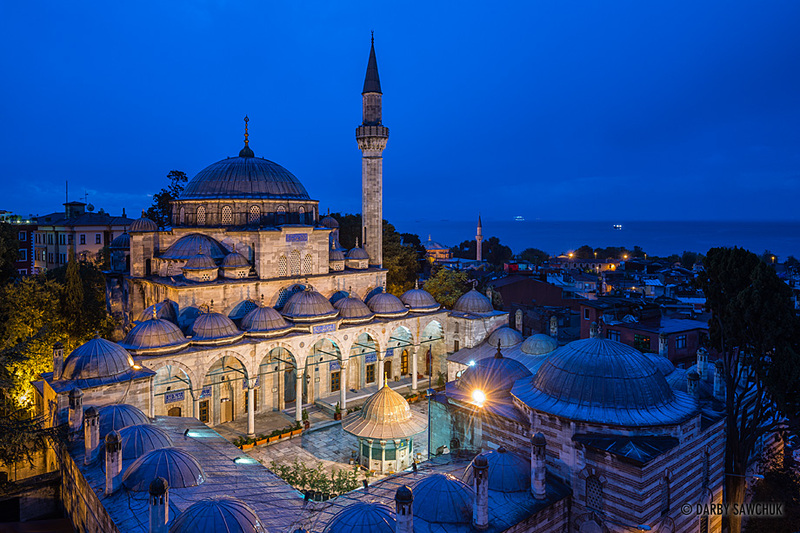 Before dawn at Sokollu Mehmet Pasha Mosque in the Kadirga neighbourhood of the Fatih district of Istanbul, Turkey. 42. 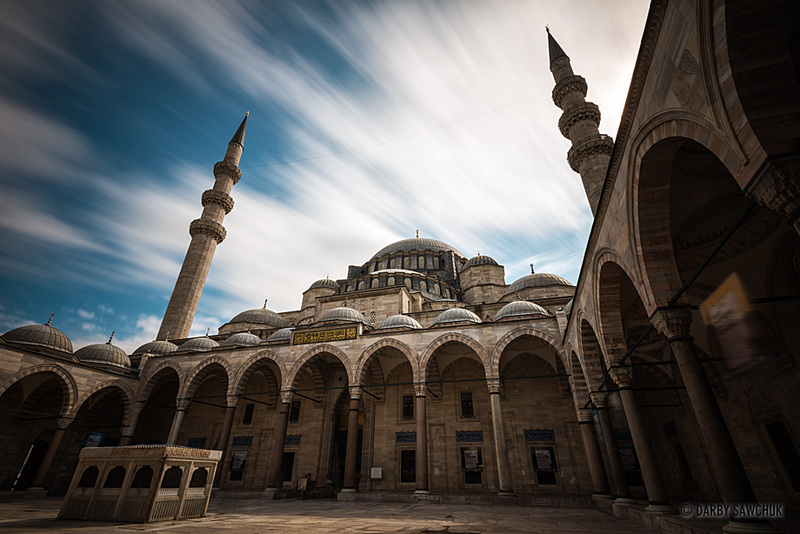 Clouds race over the courtyard of the Süleymaniye Mosque in Istanbul, Turkey. 43. 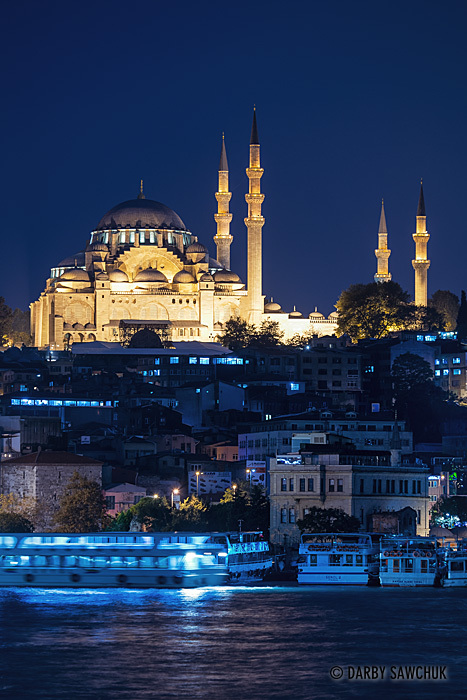 The Süleymaniye Mosque atop Istanbul’s third hill. It is the largest mosque in the city. 44. 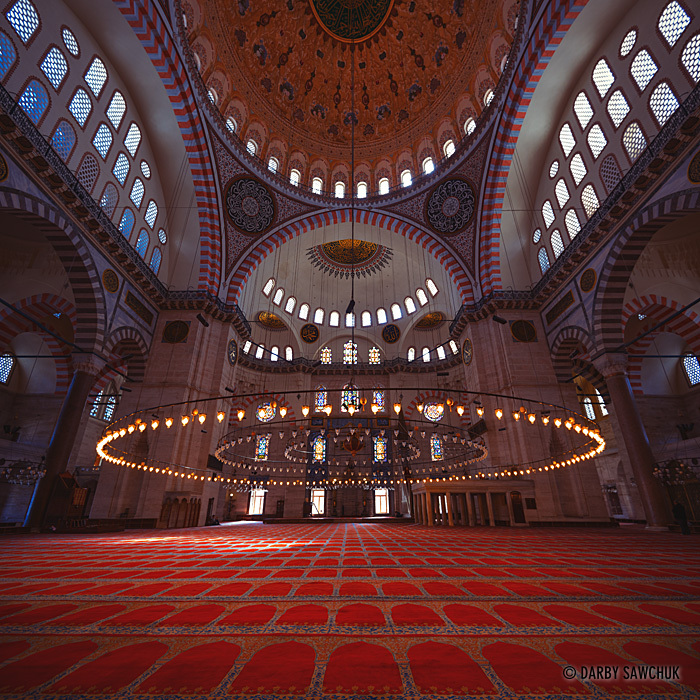 The interior of the Süleymaniye Mosque in Istanbul, Turkey. Keywords: photos of istanbul, images of istanbul, pictures of istanbul, photos of constantinople, landscape photography, travel photography, cityscape photography, architectural photography, turkey, turkish, islamic, muslim, fine art prints, stock photography.